Nothing could have made me happier than finding the first fresh strawberries of the season at a local farmers’ market, and that’s just what happened last Saturday at Market Q! We had a couple of them right away but didn’t want to eat too many at once. 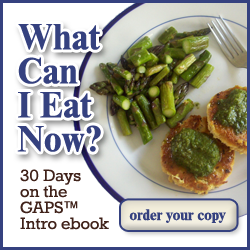 We’re still adjusting to being on the full GAPS diet, and we take new foods slowly and carefully. Strawberries seemed a little risky, because they have a high histamine content and the pollen has been out. We didn’t really want to be terribly congested! Lucky for us, they didn’t give us any trouble. TinyHands already had a rabbit in the crock-pot, but she called to tell me to take care of the vegetables. They were going to be home in 15 minutes and all I could find in the fridge were beets, turnips, a small bunch of broccolini, fennel, and lettuce from the garden (which my sweetie had already washed and dried!). The broccolini wasn’t going to be enough for 4 people and roots take too long. I cooked up the broccolini in some ghee, and started on a salad. Here it is! Wash and dry your lettuce, fennel, and strawberries. Shred the lettuce. Chop the fennel into 1/4-1/2 inch pieces. Combine the lettuce and fennel in the bowl. Quarter your strawberries and strew them on top. Slice up your almonds and do the same. Dress with extra-virgin olive oil and lemon juice. If you are not sensitive to sulfites and prefer balsamic vinegar, that works too – just make sure you choose a brand that does not have any added sugar!